Oh hell no, never will I be caught dead in that crap. If I was dead and the funeral home tried to put skinny jeans on me I would come back alive just so I could tell the idiot to track down my favorite pair of Dickies. I did some more work on it today. I cobbled a kickstand to it, and painted the chain. Not sure if there's anything wrong with painting a bike chain, but it was the option available to me so my pants legs don't keep getting rust on them. I cleaned and wiped it down as best as possible and took a rattle can to it. I don't know about that ,usually a clean and grease free surface is required for painting , might work. Well since I spray painted the chain already don't ride this bike all the time , and keep it in the garages I think I'll be fine for now. Btw I only had the problem wen wearing my slip on low tops, my boots fill out my pants cuff more preventing the issue. 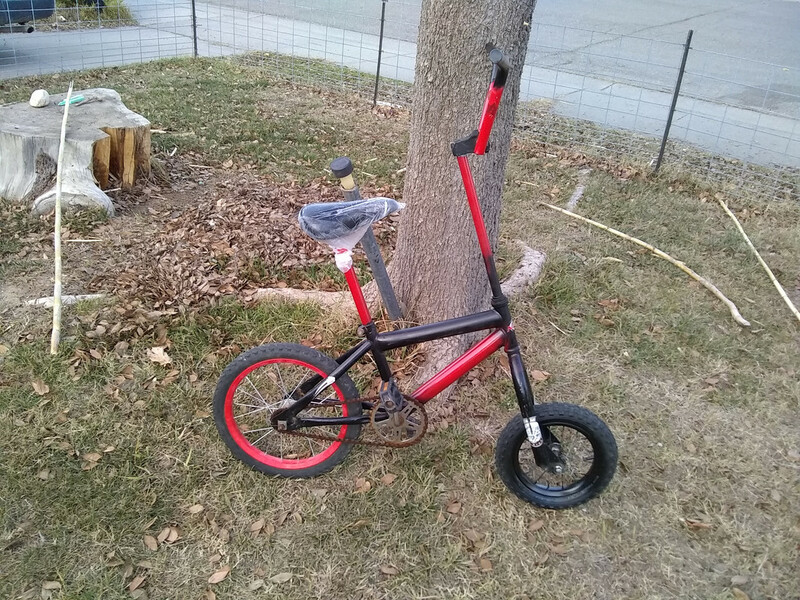 I've got a 5 dollar goodwill TMNT kid's bike I was going to do something similar to. Instead of raising the seat I was just gonna put the largest ape hangers on the front so you could stand and cruise. Btw I can tell you from trying to ride this thing standing up that it's not really easy. Not that it's a difficult feat, but just doesn't feel right. It would be cool to rake the forks and make a mini lowrider bike. Whatever you do I'd love to see a picture of it. that seat tube might be a little overstressed and may require reinforcement, but thats a heck of a find/build! nice work! Where did any pictures go, since so many have commented on it's appearance? You've got me quite curious! I don't know where the pictures went. Thanks, I have a few kinks to work out, but just haven't messed with it in a while. They have an entire bunch of people in the Portland, OR area that specialize in building and riding 'extreme' bike designs. They can be pretty amazing.